Why was the impact at Chicxulub so devastating? The impact at Chicxulub around 65 million years ago would have been devastating enough, but the effects were worse because the asteroid traveled at such a shallow angle. The approximately 6-mile-(10-kilometer-) wide object struck the Yucatan at an angle of approximately 20 degrees above the southeast horizon. If the impact had occurred straight down (perpendicular to Earth) most of the energy would have been directed into the planet’s interior. But the shallow impact angle of the Chicxulub object meant that debris—in the form of vaporized and molten rock—was scattered forward towards the northwest. This instantly destroyed all living organisms, including dinosaurs, over western North America. The material forced into the upper atmosphere by this angled impact would have cooled the climate over a period of months, effectively killing off the remaining dinosaurs. 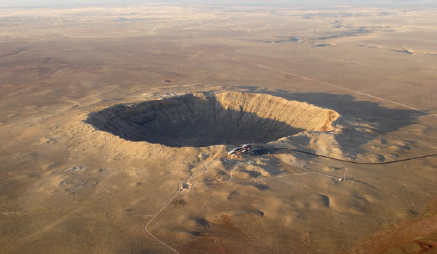 Because of erosion and other active geological processes on Earth, impact craters such as Barringer Meteorite Crater in Arizona, are uncommon. The theory that a devastating impact from an asteroid killed off the dinosaurs at first seemed like an unlikely explanation to many scientists (iStock).